Game of Thrones, which this season passed the books they’re based upon, has nabbed 23 nominations this year. You can see a full list here (PDF). Genre series are scattered throughout the nominations and, unlike the Oscars earlier this year, full of people from a variety of ethnicities. The 2016 Nebulas were awarded tonight at the Palmer House Hilton in Chicago. Female authors dominate this year’s awards, which include, as always, several works also nominated for Hugos. In a year that saw many strong SF movies, the Bradbury winner might surprise some people, and delight others. The complete list of nominees for the 2016 Academy Awards ceremony is available here. You can watch the announcements here. As far as genre entertainment goes, Mad Max: Fury Road leads the pack with 10 nominations, including Best Picture. The complete list of nominations and wins can be found here. 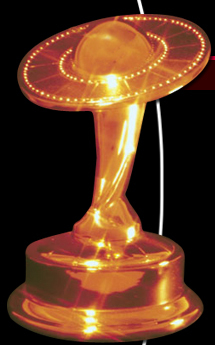 Gravity was the big winner from the genre and non-genre entertainment perspectives, although it was not chosen for Best Picture. Here they are. Share your opinion below.